COLUMBIA, Mo 2/28/14 (Beat Byte) -- Peppered with questions from Columbia City Council members at their February 17 meeting, assistant city finance director Lynn Cannon was never able to correctly answer a simple question: How much cash does Columbia's sewer utility have in its "unrestricted" account? Though the answer -- $11,733,871 -- is on page 28 of the city's latest Comprehensive Annual Financial Report (CAFR), Cannon's fifteen-minute question/answer session was such a miserable failure, audible gasps and guffaws came from around the crowd, as part of a TIF financing debate. 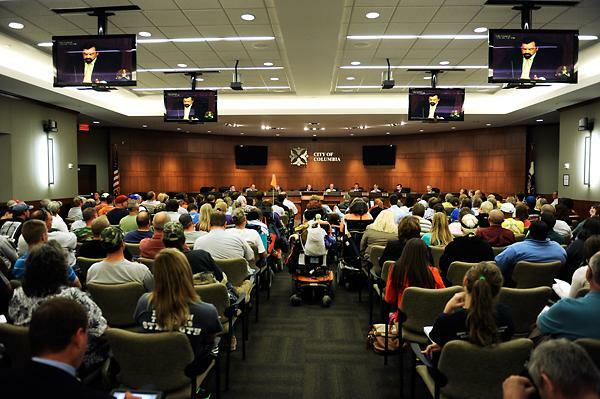 Figures swung wildly during the discussion, from $2 million to $13.9 million to $28 million back to $2 million, with contributions from Cannon, city manager Mike Matthes, Third Ward Councilman Karl Skala, and Fifth Ward Councilwoman Laura Nauser. The back-and-forth showed how little Council members know or understand about city finances -- the most important Council priority -- and how unwilling city administrators are to reveal or explain budgetary information. For her part, Cannon got just about everything wrong, including her definition of "unrestricted" funds, fund balances, and that all important figure -- $11,733,871 -- the sewer utility's unrestricted fund balance, cited multiple times in the CAFR. "Aren't you glad Lynn Cannon isn't your accountant?" quipped former Columbia public works superintendent Bill Weitkemper, after the meeting concluded. "What, currently, is the balance in the sewer utility reserve?" asked Nauser, kicking off the ill-fated discussion at 2:19 in this video. "A little under $2 million, last I checked," Matthes answered, repeatedly glancing over at Cannon and smiling. "I haven't checked recently." "On the statement of net position, dated Sept. 30, 2013, it says current assets of cash and cash equivalents are $13.9 million," Nauser responded. Then, looking at Matthes over her glasses, she put on her best doubtful mom voice. "Now...we have two?" she asked, as in where did nearly $12 million go? "This is where our reports can be very confusing," Matthes said with a smile. "Luckily, our deputy finance director...." Matthes looked at Cannon, then gave it a try himself. "My understanding of the CAFR is that it takes that DAY, and says how much cash do you have on hand," he said to Nauser. "What it doesn't really describe is what do you need to make it through the next month, and so we -- we try to carry at least two months worth of reserves to carry us through, and the $13.9 million would have been how much did we have that day. "Now getting through the next month with sewer money might cost $12 million, or it might cost $11 million, but uh -- so there's a different -- the CAFR is measuring a different scenario. Lynn!" Then Cannon took over. "What exact cash balance are you looking for?" she asked the Councilwoman. "I just want to know what's being held in cash reserves in the sewer utility and the water and light utility," Mrs. Nauser said. "What money do we have if an emergency came up today?" "Well, as of right now we don't have an official cash balance," Cannon replied. "We just finished the audit for the CAFR so we have to update five months worth of actual activity and close those funds out. As of right now, we've closed out through November. To get a cash balance...."
Cannon stopped, hunting around for papers. "We're required to have a reserve in these accounts, so what is that reserve?" Nauser asked. "Right," Cannon said. "That reserve is based on twenty percent of expected expenditures for the next year." At roughly $12 million in expenses, the reserve should be around $2.4 million. The unrestricted fund balance of $11,733,871 includes the reserve -- and then some. "As far as CAFR is concerned, cash is cash, but when you're looking at what do we really have, you have to take that cash balance and take out the things that you've already budgeted money for and set aside. These are the capital projects we're going to do. We have to pull those moneys aside and restrict them. And we also pull out the money for restricted bond payments and anything that would otherwise be restricted." "So what is that amount?'' Nauser persisted. "As of today? I don't have that number," Cannon said. But that statement is not credible. The amount as of February 17, 2014 would either be a little more or a little less than it was on Sept. 30: $11,733,871. It is, by the definition on page 46 of the CAFR, precisely the figure Cannon defined: the amount of cash and cash equivalents left over after accounting for capital (contruction) projects; bond payments "and anything that would otherwise be restricted." That's why it's called the "Unrestricted Fund Balance"!